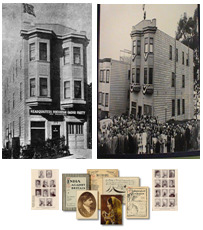 The Hindustan Gadar Party, when founded in 1913 to join in the struggle for India’s independence, started its operation from 436 Hill Street, San Francisco. Its original home was known as "Yugantar Ashram" and it was from here that the freedom fighters of the Hindustan Gadar Party, also known as "Gadri Babas" were active from 1913 to 1917. It was from this place that they would organize and launch a revolution and publish a powerful weekly paper called "Gadar" to propagate the cause of Indian independence. The Party’s Headquarters subsequently moved to "5 Wood Street", the present location. The activities of the Gadar Party were so intense, its popularity instantaneous, the edifice soon came to be called "Gadar Ashram". The three-storeyed building that preceded the present structure served several functions. Imbued with the spirit of revolution, it provided an environment for thinkers, activists and volunteers who came to live, work, organize and help run a printing press that sent their messages around the world. It remained their venue for all-important public and secret meetings. So powerful was its influence that in August 1914, when the Party called on overseas Indians to return to India to fight for its freedom, most living in North America heeded the call and no fewer than 8,000 of them were said to have returned to India to take part in the revolution. Because of the strong British vigilance, most of them were captured en route or upon return, many of them sent to jail, some killed or hanged. But their determination, courage and sacrifice inspired thousands others to join in and continued to carry out their mission. The Gadar Building is now the living symbol of the glorious sacrifices of martyrs of the freedom and those who struggled for India’s freedom. After India won its freedom, the Ashram along with its belongings including some historical records etc. was handed over in 1949 to the Government of India through our Consulate. However, de jure transfer was effected in June 1952. The building, at that stage, was about 30 years old and it was very much in a dilapidated condition. Efforts were made from 1952 onwards to set up a suitable memorial, by the local Indian community and the Government of India, the latter sanctioning US$ 83,000 for the restoration work. The ground breaking ceremony for the restoration of the Building was performed by Sardar Swaran Singh, the then Minister of External Affairs in September 1974. The Gadar Memorial was finally inaugurated by Shri T.N.Kaul, at that time India’s Ambassador to US in March 1975. Gadar Memorial Library was inaugurated by Shri Y.B.Chavan, the then Minister of External Affairs in October, 1976, marking the donation of books by the Indian Council for Cultural Relations. The Library has a collection of Hindi & English books on various subjects. Apart from celebrating national festivals like Independence Day and Republic Day, from time to time, the Consulate General also organizes other official functions at the Gadar Memorial Hall.